In December 1800, Lieutenant James Grant on board the Lady Nelson sighted a wide bay which he named Portland Bay after a Secretary of State, the Duke of Portland. The bay had an abundance of seals and whales and by the early 1830s, sealers and whalers had established a whaling station and trading port on the bay. As the richness of the pastoral hinterland became apparent, other settlers, led by the pioneering Henty brothers, took up land in the area. It became apparent that the combination of fine grazing land, the substantial numbers of whales and seals and a good sheltered harbour made the location an outstanding prospect for a permanent township. 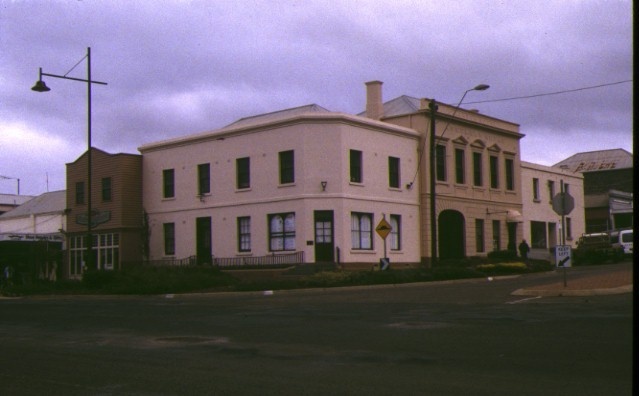 On the favourable advice of Foster Fyans, the Police Magistrate for Geelong, the government commenced the set out of a new township in 1840. The London Inn has long been considered a landmark in the town. 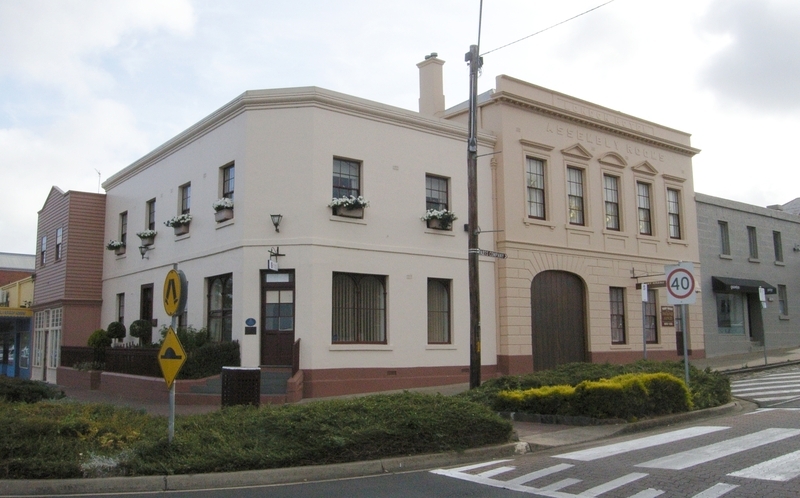 The current building comprises the two-storey corner building [possibly originally single storey in the mid 1840s but in this form before 1853], a former billiard room on Bentinck Street , and the former assembly rooms on Julia Street . The London Inn occupies a corner site that was an important meeting spot from an early period in the town's development. One of Portland's prominent early settlers, Stephen G. Henty, purchased the site from the Crown in October 1840 for £1100 and built a single storey building on it in 1844. Henty sold the property to publican John Wiggins who transferred his license to this site from an earlier London Inn in Gawler Street. The hotel became a favoured place for shipping passengers staying in Portland and also became a favourite meeting place for sporting clubs. In an October 1854 advertisement, William Douglass stated that he had now completed ?an addition to his bed room accommodation? at the London Inn. In November 1855, Douglass announced his intention to erect a billiard room adjacent to the hotel in Bentinck Street to house a billiard table purchased from the estate of the licensee of the Portland Inn. In 1856, the London Inn served as the venue for the first meeting of the Portland municipal council. In 1862, licensee John Pilven added a large two storey London Assembly Rooms with a dining room on the ground floor and assembly rooms on the upper floor was added adjacent to the hotel on the Julia Street frontage. A carriageway at street level gave entry to the hotel yard. The designer of the assembly room building was Daniel Nicholson, an architect of whom little is known. The assembly rooms building opened on New Years Night 1863 with a ball held under the patronage of the Forester's Lodge. The construction of the building reflected a period of continuing prosperous trading activity at Portland and became an important meeting place for merchants, traders and local organizations. The hotel, sometime later known as the London Hotel, passed through a number of ownerships and occupancies before the license was terminated by the Licenses Reduction Board in 1922. The building became a guest house (operating as the London Guest House), benefiting from Portland's popularity as a popular seaside holiday destination. The building was converted to commercial use sometime after the 1960s. 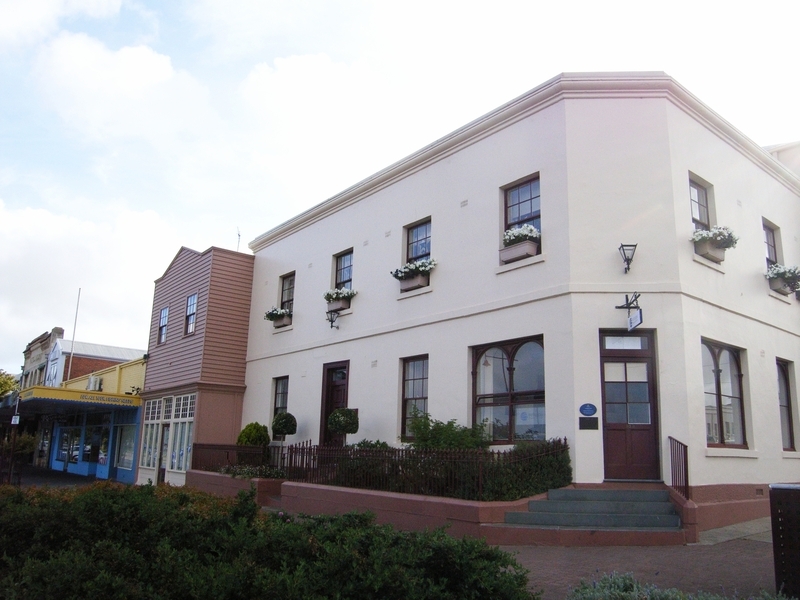 The London Inn at Portland is of historical and architectural significance to the State of Victoria. The London Inn, Portland, is of architectural significance as a representative example of a Victorian Georgian style hotel. Georgian styles remained strong in Portland into the 1850s owing to the dominance of architectural influences from Tasmania, where the majority of early settlers had originated. Town of Portland. No. 237. London Inn, 93 Bentinck Street, Portland. The London Inn occupies a corner site that was an important meeting spot from an early period in the town’s development. One of Portland’s prominent early settlers, Stephen G. Henty, purchased the site from the Crown in October 1840 for £1100 and built a single storey building on it in 1844. Henty sold the property to publican John Wiggins who transferred his license to this site from an earlier London Inn in Gawler Street. The hotel became a favoured place for shipping passengers staying in Portland and also became a favourite meeting place for sporting clubs. In an October 1854 advertisement, William Douglass stated that he had now completed ‘an addition to his bed room accommodation’ at the London Inn. In November 1855, Douglass announced his intention to erect a billiard room adjacent to the hotel in Bentinck Street to house a billiard table purchased from the estate of the licensee of the Portland Inn. In 1856, the London Inn served as the venue for the first meeting of the Portland municipal council. In 1862, licensee John Pilven added a large two storey London Assembly Rooms with a dining room on the ground floor and assembly rooms on the upper floor was added adjacent to the hotel on the Julia Street frontage. A carriageway at street level gave entry to the hotel yard. The designer of the assembly room building was Daniel Nicholson, an architect of whom little is known. The assembly rooms building opened on New Years Night 1863 with a ball held under the patronage of the Forester’s Lodge. The construction of the building reflected a period of continuing prosperous trading activity at Portland and became an important meeting place for merchants, traders and local organizations. The hotel, sometime later known as the London Hotel, passed through a number of ownerships and occupancies before the license was terminated by the Licenses Reduction Board in 1922. The building became a guest house (operating as the London Guest House), benefiting from Portland’s popularity as a popular seaside holiday destination. The building was converted to commercial use sometime after the 1960s. Allom Lovell, ‘Pre-1851 Structures in Victoria Survey’, prepared for HV, vol. 3, p. 211-18. Gwen Bennett, Old Watering Holes of the West , pp. 62-63. Gwen Bennett. Portland: Now and Then, 1993, p. 24. Portland Observer, 18 October 1876 [1976? ], on file. National Trust of Australia (Vic. ), file no. 3059. Helen Doyle, ‘Portland Inn, 4 Percy Street, Portland’, report prepared for HV, 2004.